Combining the latest research with an interdisciplinary approach delivers better outcomes. 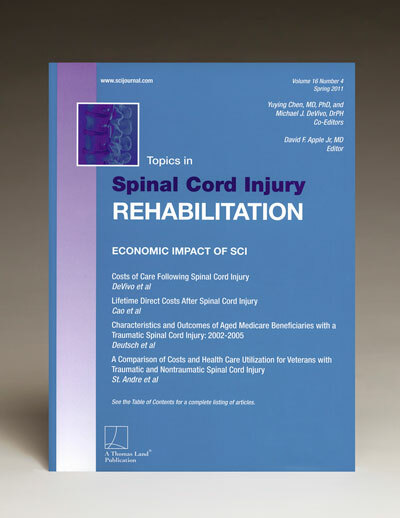 Topics in Spinal Cord Injury Rehabilitation is the leading resource for clinical, peer-reviewed, and state-of-the-art information on traumatic and nontraumatic SCI. Topics in Spinal Cord Injury Rehabilitation is an essential resource for the entire SCI care team, including physiatrists, PTs, OTs, rehabilitation nurses, psychologists, neurologists, orthopedists, and many other team members. Each issue focuses on research papers that keep you up-to-date with the latest clinical developments and an in-depth review of a single key topic. The result is an ongoing update service that keeps your skills at the leading edge of practice. Check the Access Journal page to see a listing of topics by issue. of previous issues, back to 1998. Check our subscription rates at SUBSCRIBE. Benefit from authoritative, practical information. Co-Editors-in-Chief Lawrence C. Vogel, MD and Kathy Zebracki, PhD, and Associate Editors Suzanne L. Groah, MD, MSPH and M. J. Mulcahey, PhD, OTR, work closely with a world-renowned Editorial Board to ensure that TSCIR delivers the information you need - the latest research and hands-on guidance from recognized leaders in the field. Topics in Spinal Cord Injury Rehabilitation is Indexed in Index Medicus and MEDLINE, PUBMED Central, EMBASE, the Excerpta Medica database; CINAHL, the Cumulative Index of Nursing and Allied Health Literature; Psychological Abstracts; PsycINFO; PsycLIT; and OT Bibsys. © 2006-2019 Thomas Land Publishers Incorporated. All Rights Reserved.